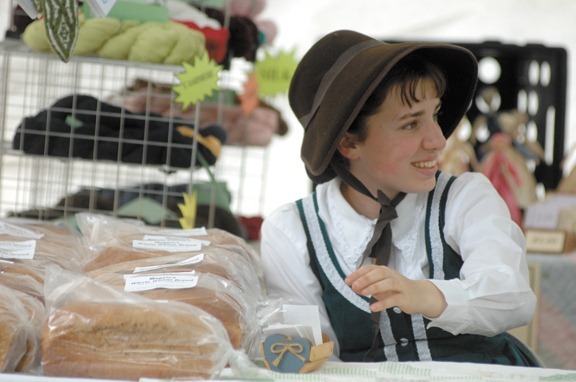 Maggie spend the weekend (Fri-Sun) working a booth at the Edmonton-Metcalfe County Sesquicentennial Celebration, selling homemade bread, soap, recycled yarn, aprons, and other things she’s made. The picture above appeared on the front page of the local Sunday paper. Alan Jacobs has written a fine, fine essay on why online discussion (and modern life in general) has become so contentious. It’s especially helpful because it begins with an episode in the Christian blogosphere, where conservative Anglicans were not only attacking Archbishop Rowan Williams for his liberal stances, they were claiming that he was clearly not a believer, despite his own profession of faith. A couple of years ago, I was visiting an Anglican blog, as was then my habit, and came across an article in which a theological conservative — that is, someone on “my side” of the Anglican debate, if (God help us) we must speak in such terms — was accusing Archbishop Williams of something like complete epistemological skepticism, effective unbelief. Jacobs, a conservative who nonetheless respects Williams as a Christian thinker, jumps to his defense with clear evidence that clearly refuted the charges of skepticism. I have heard many of my fellow conservatives speak of Williams in this way. I thought that if they were to read what he writes, or listen to what he preaches —this magnificent sermon, for instance — they would no longer speak of him so dismissively. I wrote a comment on this post, challenging the critique of Williams and linking to sermons, talks, and essays that demonstrated beyond any doubt that the charge of skepticism was false. The result was surprising, at least to those of us who think that even adversaries should be given the benefit of the doubt and taken at their word. None of this convinced the author of the article or other commenters. The general conviction was that Williams had not acted decisively for conservative causes, especially regarding sexuality, and therefore that anything he said or wrote that savored of theological orthodoxy amounted to protective coloration at best and outright deceit at worst. Why would Williams’s critics dismiss the clear evidence that Jacobs had offered? In their minds, he was the enemy of orthodoxy and therefore their enemy, and could be granted the benefit of no doubt. (Never mind that on liberal Anglican blogs he was simultaneously being condemned for having sold out to the forces of right-wing reaction. And never mind what Jesus said about loving your enemies, even assuming that Williams really is an “enemy.”) They believed that Williams was wrong and had to be resisted by all available means, tarred by any brush at hand. We have entered a time when we assume that those who are not with us are against us, that there is no room for peaceful difference of opinion, when total war is the preferred response to those we think are wrong. It is surprising to me that so many Christians not only embrace this mindset but celebrate it. Jacobs points to a culprit, and I think he is right. I have thought a lot about why people get so hostile online, and I have come to believe it is primarily because we live in a society with a hypertrophied sense of justice and an atrophied sense of humility and charity, to put the matter in terms of the classic virtues. His reasons for concluding this are well worth reading, so I won’t excerpt or summarize them. But I do want to highlight his final observation, which I take as cautionary. I suppose it is some sort of delicious irony that those who allow their notions of justice crowd out humility and charity will necessarily end up jettisoning justice as well. But I gave up savoring irony long ago. Instead, I fret about those who go to cultural war under the banner of Christ, and hope that it ends up being just one more passing fad to be added to the junk heap of Christian history, along with fundamentalist separation, youth groups, mass revivals, discipleship, folk music, Jesus freaks, the Moral Majority, megachurches, Reconstructionism, small groups, cell churches, Promise Keepers, contemporary worship, emergent worship, and patriarchy.